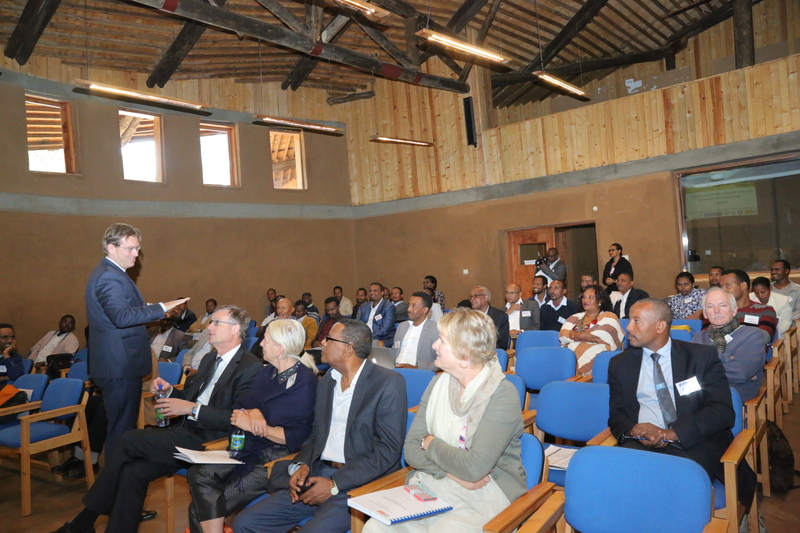 The African Center for Disaster Risk Management of the Addis Ababa University hosted a kick-off event for the Ethiopian Educational Network to support Agricultural Transformation (EENSAT) Project at the Gulele Botanic Garden on 5th Oct. 2017. The one day workshop intended to address the role of geo data for agriculture and water to enhance food security and socio-economic development in Ethiopia. The session featured paper presentation and key note speeches on the areas of Geographic Information Technologies, agriculture and food security in Ethiopia. In his opening remarks, executive director of the Horn of Africa Regional Environment Center and Network, professor Nigussie Reta, underlined the importance of linking GIT to agriculture to ease data collection and create access that can enhance food and water security. Professor Tom Veldkamp, ICT Dean of the University of Twente, noted that food security, water supply, climate change and population growth are among the top agenda that need thorough emphasis. Collaborative capacity development in GIS to easily collect data is mandatory to mitigate these challenges, according to his statement. The EENSAT project is run under the auspices of three universities from Ethiopia: AAU, Bahir Dar University and Mekele University in collaboration with the University of Twente and the financial assistance of the Dutch Organization for Internalization in Education.